For information about The Norman Remington Co., I found everything I was seeking (and more) in Frederick N. Rasmussen's nostalgic and bittersweet July 23, 2011, article in The Baltimore Sun headlined "Demise of Borders recalls the end of Remington's." The bookstore, in its various incarnations, was in business from 1910 to 1986 in Baltimore. The original founders were Stanley G. Remington and William Wollstonecraft Norman. The bookstore was also the purchasing agent for several libraries and had a used-book section devoted to Marylandia. There are many more great details in Rasmussen's article. I recommend that you read the whole thing. 1. Basil King's full name was William Benjamin Basil King. He lived from 1859 to 1928 and was a clergyman who became a writer. According to Wikipedia, "The Conquest of Fear (1921) portrayed his own struggle with ill health and eventual spiritual growth, and lays out his somewhat mystical approach to religious understanding." The book is available from Project Gutenberg. 2. That sounds like a wonderful job. Where do I sign up? 3. Leinwall died on New Year's Day in 1993. 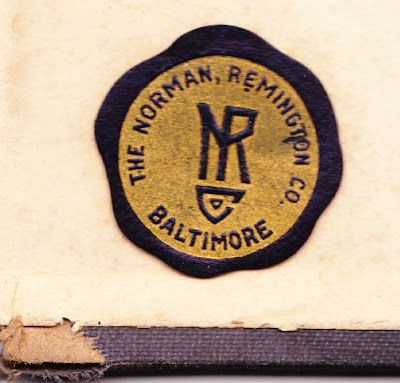 Later that month, The Baltimore Sun's James H. Bready wrote: "The year started with the death of George F. Leinwall -- book man, collector, patron; on Jan. 1, at age 77, of cancer, at his home in Carroll County, his wife Mary Helen and their daughter Francesca at his side. By his request, there was no service, no death notice or obituary, no fuss." Chris- I loved seeing this and reading it. My family's legacy is a part of Baltimore. Would you consider selling it? Thanks for your note. I am sure we can arrange something if you want to contact me at cotto@ydr.com. I would love to get this part of your family's history to you. I am also proud To see My Great great Grand Father Stanley G Remington (Whom I am named after) My Grand Father John T Remington and Uncle John C Remington how the were part of American History of the book business! To see the dates that Stanley started in the late 1800's makes me glad that I am part (only a small part) of this family's History! My Dad was active duty Navy so we were not in Baltimore but twice a yr to visit with the Remington family and I as a little boy got to see the Charles St Offices and store before it closed 1979. I thought it was a cool place hanging in the history and stories of the location. Also the example of their work ethic. They did Baltimore Proud! Thank you!